Whalers and sealers working out of Launceston had been visiting the coastal areas around Port Fairy and Portland areas throughout the 1830s and some had set up camps and huts during their stays. The informal settlement situation at Port Fairy Bay changed dramatically in 1843 when James Atkinson formally acquired title to 5,120 acres west of the Moyne River, most of which Atkinson had taken up under licence in 1839. In 1841, Atkinson, having completed the clearing of the town area, began survey work for town streets, blocks and allotments. The few existing settlers at Atkinson?s new town of Belfast had no rights to title to their land, but Atkinson quickly established leasing arrangements in order to provide some commercial return to Atkinson and his partners and to encourage further settlement. The Scottish-born David McLaws entered into a lease for the block at the corner of Bank and James Streets in 1844 and is first recorded as the licensee of the Caledonian Hotel in the same year. The size of the hotel held by McLaws at this time is not known, but the hotel was apparently constructed in stages as the interior of the whole of the attic storey to the James Street elevation remains unfinished as the workmen reputedly abandoned the site and departed for the goldfields. Despite holding a twenty one year lease with an option of a further fourteen years, McLaws purchased the acre block from Atkinson in 1850 for £200. McLaws personally held the licence for the hotel for the majority of the time between 1844 and about 1860 and the hotel remained in the McLaws estate until 1887. 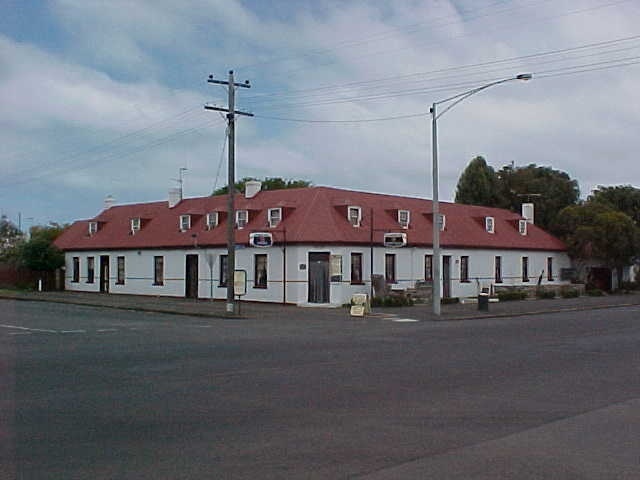 The Caledonian Inn became well known as the venue for horse sales, including those of Thomas Browne, more well-known as the writer Rolf Boldrewood, who lived in the Port Fairy district from 1843 to 1856. In 1856, sales were conducted for William Rutledge & Co and in November 1872, the Western Horse Bazaar was opened there by William O?Brien. Meetings of the Belfast Racing Club, Belfast Rifle Club and Belfast Rowing Club were held also held at the Caledonian Inn. The hotel was used for functions as varied as inquest hearings, commercial auctions and entertainment such as the Tradesmen and Farmer?s Ball in 1855. 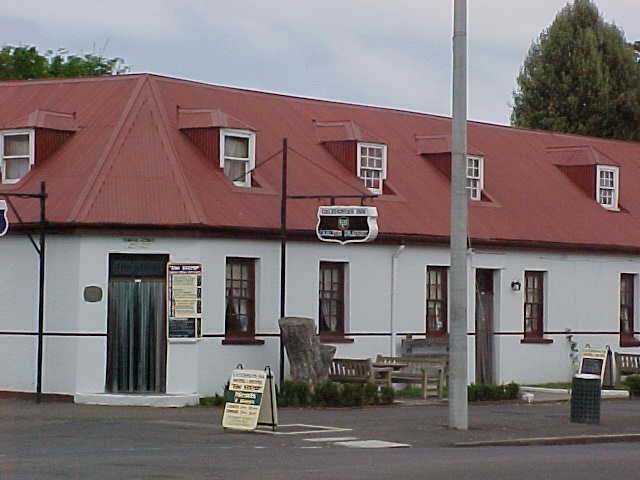 The hotel remains an important element in the social life of Port Fairy and continues to be a venue for musical performances. In 1970, the hotel was renovated and a substantial addition made to the elevation on Bank Street in a style replicating the original Georgian form. Requirements of the Victorian Liquor Commission were partially waived to effect preservation of the basic character of the hotel. The original section of the Caledonian Inn is constructed of rubble stone with a steep pitched hip roof enclosing attic bedrooms lit by dormer windows. The angled corner door, the Georgian window sashes and plain internal joinery are all characteristic of early colonial architecture in Victoria. The form of the hotel, with its several doors onto the street frontages and the unfinished state of the attic storey, indicates that the building may have been constructed in stages prior to 1861. One of the early dormers has been removed and the original timber shingle roof has been replaced with corrugated iron. While the replication of Georgian form and detail in the 1970 addition is detrimental to the understanding of the form of the original building, the external appearance of the early portion appears to have changed little since at least 1861. 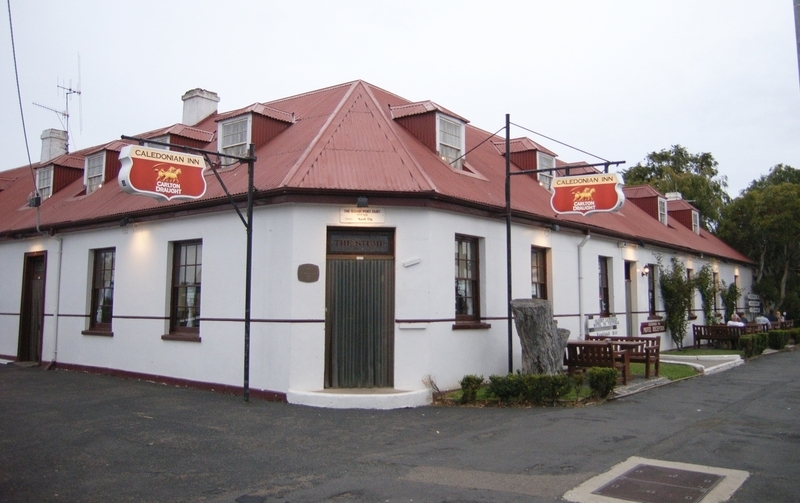 The Caledonian Inn is of historical and architectural significance to the State of Victoria. The Caledonian Inn is of historical significance as probably the oldest continuously licensed hotel in the State having operated without interruption since 1844. The corner portion of the existing hotel probably dates from that year, making it one the earliest hotels in Victoria. The name Caledonian Inn is a reflection of the Scottish origins of the original owner David McLaws and the long-term association of the hotel with the McLaws family. The hotel is significant as a venue for social, commercial and official functions for more than one hundred and sixty years and remains a central element in the interpretation of the early development of Port Fairy, one of Victoria?s earliest townships. The Caledonian Inn is of architectural significance for the retention of the early colonial forms such as simple shape, the chamfered entrance corner, and multi-pane sashes which are all essential characteristics of hotels in the pre-separation Victorian Georgian style. Although the major portion of the hotel appears to have been built in stages before 1861, the overall form reflects the style of its 1844 origins. The hotel is significant for the survival of the numerous hipped roof dormers to the attic storey, some of which retain their original sashes. Borough of Port Fairy. No. 247. Caledonian Hotel, Cnr. James and Bank Streets,Port Fairy. 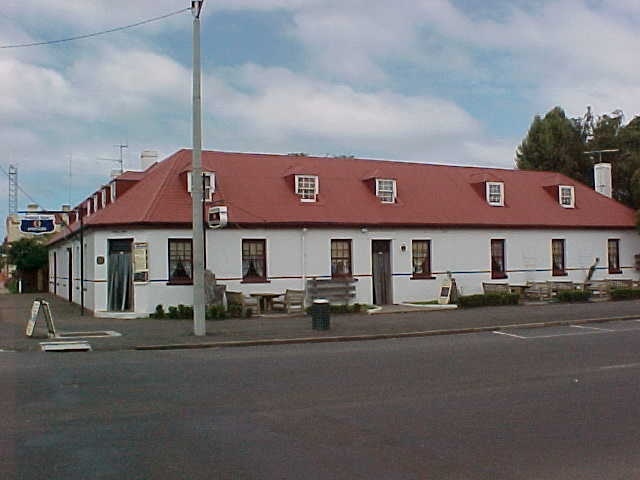 The Caledonian Inn became well known as the venue for horse sales, including those of Thomas Browne, more well-known as the writer Rolf Boldrewood, who lived in the Port Fairy district from 1843 to 1856. In 1856, sales were conducted for William Rutledge & Co and in November 1872, the Western Horse Bazaar was opened there by William O’Brien. Meetings of the Belfast Racing Club, Belfast Rifle Club and Belfast Rowing Club were held also held at the Caledonian Inn. The hotel was used for functions as varied as inquest hearings, commercial auctions and entertainment such as the Tradesmen and Farmer’s Ball in 1855. The hotel remains an important element in the social life of Port Fairy and continues to be a venue for musical performances.